Info "Look at the picture at the bottom for a hint and complete the word!" Fill in the Blanks is one of Orbulon's microgames in WarioWare: Twisted! The point of the game is to spell the name of the object underneath the letter. 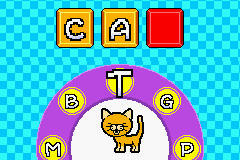 The player will have to tilt the Game Boy Advance to select a letter and press to confirm it. 1st level difficulty: Only one blank must be filled in. The possible words in this level can be: sun, bug, dog, cat or PC. 2nd level difficulty: Two blanks must be filled in. Gnat, ball, fish, arm, and farm are the possible words. 3rd level difficulty: Three blanks must be filled in. In this level, phone, watch, bloom, mouth, squid or fruit can be shown. This page was last edited on September 20, 2018, at 08:44.